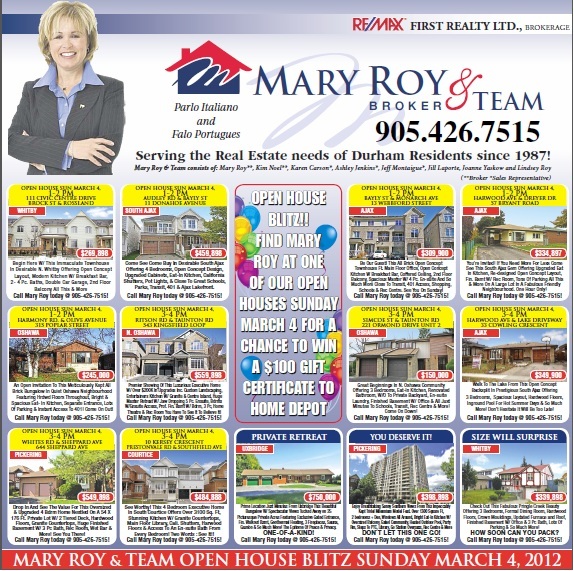 We are proud to announce that this Mar 4th, 1:00 PM to 2:00 PM we will be hosting an Open House at Poplar St. , Oshawa. This is an opportunity to visit this excellent Detached for sale in beautiful . We are proud to announce that this Mar 4th, 3:00 PM to 4:00 PM we will be hosting an Open House at Kingsfield Loop in the Taunton neighborhood, Oshawa. This is an opportunity to visit this excellent 2-Storey for sale in beautiful Taunton. UPDATED: South Courtice Open House! We are proud to announce that this Mar 4th, 3:00 PM to 4:00 PM we will be hosting an Open House at Kersey Crescent in the South Courtice neighborhood, Courtice. This is an opportunity to visit this excellent 2-Storey for sale in beautiful South Courtice. We are proud to announce that this Feb 4th, 3:00 PM to 4:00 PM we will be hosting an Open House at Kersey Crescent in the South Courtice neighborhood, Courtice. This is an opportunity to visit this excellent 2-Storey for sale in beautiful South Courtice. We are proud to announce that this Mar 4th, 1:00 PM to 2:00 PM we will be hosting an Open House at Kingsfield Loop in the Taunton neighborhood, Oshawa. This is an opportunity to visit this excellent 2-Storey for sale in beautiful Taunton. Please come with any questions you may have. In the meantime you can take a virtual tour of this Taunton 2-Storey for sale. We are proud to announce that this Mar 4th, 1:00 PM to 2:00 PM we will be hosting an Open House at Kersey Crescent in the South Courtice neighborhood, Courtice. This is an opportunity to visit this excellent 2-Storey for sale in beautiful South Courtice. Please come with any questions you may have. In the meantime you can take a virtual tour of this South Courtice 2-Storey for sale. We are proud to announce that this Mar 4th, 3:00 PM to 4:00 PM we will be hosting an Open House at 221 Ormond Drive , Oshawa. This is an opportunity to visit this excellent 2-Storey for sale in beautiful . We are proud to announce that this Mar 4th, 1:00 PM to 2:00 PM we will be hosting an Open House at 57 Bryant Road , Ajax. This is an opportunity to visit this excellent 2-Storey for sale in beautiful .